This is my home on Tarzana. I have lived here for four years. I love it here and I believe you will love it. I hope to live here the balance of my life, and that is the reason I am trying to get nice people as my neighbors. 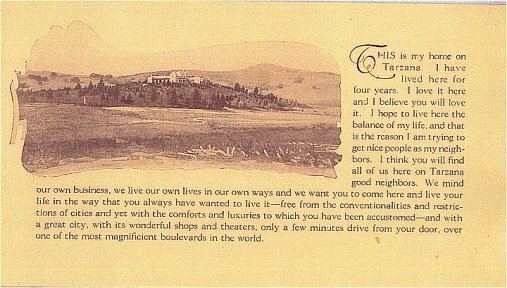 I think you will find all of us here on Tarzana good neighbors. We mind our own business, we live our own lives in our own ways and we want you to come here and live your life in the way that you always have wanted to live it -- free from the conventionalities and restrictions of cities and yet with the comforts and luxuries to which you have been accustomed -- and with a great city, with its wonderful shops and theaters, only a few minutes drive from your door, over one of the most magnificent boulevards in the world. Tarzana Ranch comprising some five hundred and fifty acres stretching from Ventura Boulevard to the summit of the Santa Monica Mountains, lies inside the city limits of Los Angeles on the broad state highway leading to Santa Barbara and San Francisco. 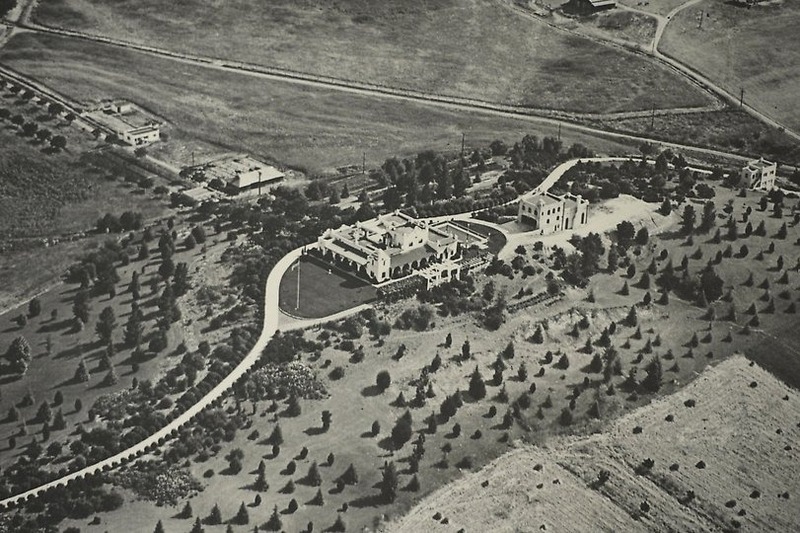 Formerly the country estate of the late General Harrison Grey Otis, it has always been one of the show places of Southern California. The main residence, standing on the summit of a low hill a half mile from the highway, represents General Otis' conception of a typical, modern Spanish-American home, with its broad arcades and spacious central patio. It is from the hundred acres of rolling land between the residence and the highway that I invite you to choose your home-site and become my neighbor, enjoying with me the peace and beauty that is Tarzana. Here you may build the home of our dreams -- and expression of your own individuality, embodying in an artistic whole those practical features which make a home livable as well as beautiful -- the little essential refinements that you have missed in other homes and determined to have some day in your own. Tarzana Canyon winds into the mountains back of Tarzana and it is in the mouth of this canyon, behind The Hill upon which my home is built, that we raise our Berkshshire swine, our Guernsey cattle and our saddle horses. If you have children they will find here, as my children have, a wonderful, new world beside which the artificial interests of the city are dwarfed to insignificance; and you , too, will find new interests, the cultivation of which will add years of buoyant health to your life. YOUR HOBBY Do you love music and the drama? The world famous Hollywood Bowl, with its wondrous programs and its wealth of talent, is but a thirty minute drive from Tarzana. The Pilgrimage Play is the same distance. The All Star Actors Equity performances are five minutes farther. Do you love golf or tennis? Fifteen minutes from Tarzana lies the beautiful Hollywood Country Club. There is no finer golf course in Southern California and their tennis courts are equally modern and never crowded. Do you love surf bathing and the ocean? You can get both forty-five minutes away through the scenic Topanga Canyon five miles west of Tarzana. Do you love riding and hiking? 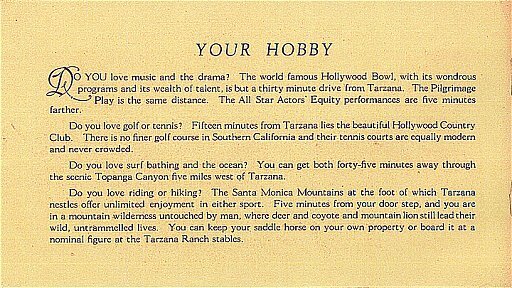 The Santa Monica Mountains at the foot of which Tarzana nestles offer unlimited enjoyment in either sport. Five minutes from your door step, and you are in a mountain wilderness untouched by man, where deer and coyote and mountain lion still lead their wild untrammelled lives. 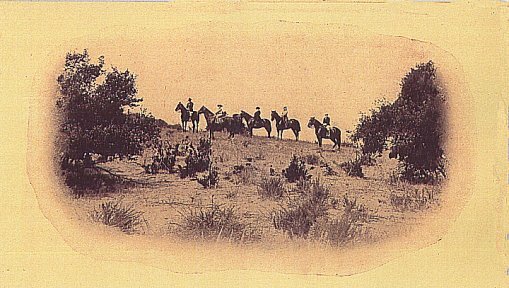 You can keep your saddle horse on your own property or board it at a nominal figure at the Tarzana Ranch stables. 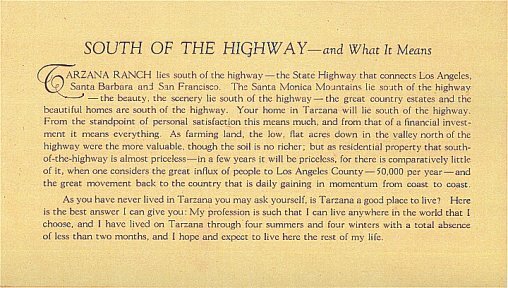 SOUTH OF THE HIGHWAY -- and What It Means Tarzana Ranch lies south of the highway -- the State Highway that connects Los Angeles, Santa Barbara and San Francisco. 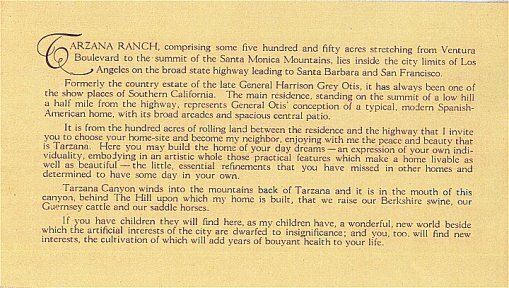 The Santa Monica Mountains lie south of the highway -- the beauty, the scenery lie south of the highway -- the great country estates and the beautiful homes are south of the highway. Your home in Tarzana will lie south of the highway. From the standpoint of personal and satisfaction this means much, and from that of a financial investment it means everything. As farming land, the low, flat acres down in the valley north of the highway were the more valuable, though the soil is no richer, but as residential property that south-of-the-highway is almost priceless -- in a few years it will be priceless, for there is comparatively little of it, when one considers the great influx of people to Los Angeles County -- 50,000 per year -- and the great movement back to the country that is daily gaining in momentum from coast to coast. As you have never lived in Tarzana you may ask yourself, is Tarzana a good place to live? 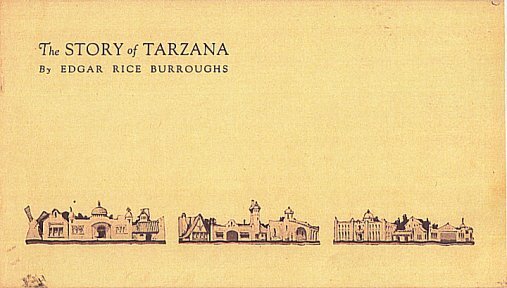 Here is the best answer I can give you: My profession is such that I can live anywhere in the world that I choose, and I have lived on Tarzana through four summer s and four winters with a total absence of less than two months, and I hope and expect to live here the rest of my life. A SPLENDID INVESTMENT There will be about eighty one-acre residence sites in this subdivision of Tarzana, each equivalent to six ordinary city lots. for your protection as well as my own I have placed a few reasonable restrictions that will prevent the creation of unsightly buildings, the destruction of trees, the maintaining of nuisances, and the presence of business districts. I am not so much interested in what a home costs, however, as what it looks like. It may be inexpensive, but it must be artistic. Upon the sixty-three one hundred feet deep business lots fronting Ventura Boulevard, with a twenty foot alley in the rear, I hope to see built a unique shopping district that will attract the favorable attention of all Southern California -- a row of beautiful, yet practical buildings. Upon the front cover is a suggestion of what I have in mind. 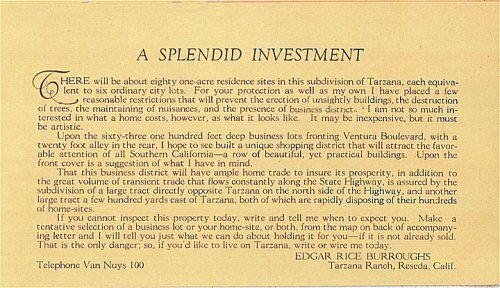 That this business district will have ample home trade to insure its prosperity, in addition to the great volume of transient trade that flows constantly along the State Highway, is assured by the subdivision of a large tract directly opposite Tarzana on the north side of the Highway, and another large tract a few hundred yards east of Tarzana, both of which are rapidly disposing of their hundreds of home-sites. If you cannot inspect the property today, write and tell me when to expect you. 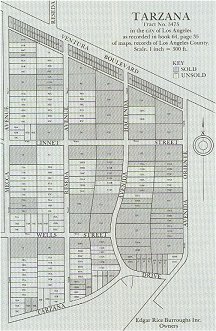 Make a tentative selection of a business lot or your home-site, or both, from the map on back of accompanying letter and I will tell you just what we can do about holding it for you -- if it is not already sold. That is the only danger; so, if you'd like to live on Tarzana , write or wire me today.